Wow! Can you believe it’s the middle of November already? It boggles my mind how quickly time passes now that I am getting older. It doesn’t help that I am always busy doing something either! The weather here has not been terribly chilly. The leaves are falling and swirling in the winds that gust through the area. Halloween is over and Thanksgiving is almost here. Of course all the stores had all their Christmas decorations out before Halloween arrived. Such silliness. I was getting e-mails telling me how many days it was until Christmas! Right away it started stressing me out. I thought to myself, this is ridiculous! You can only do so much Carol, so calm down and carry on. One thing at a time. Finish one project and move on to the next. And I am going to try and keep that in my mind too! But this time next month I will most likely be running around like a whirling dervish! My grandson and granddaughter will be celebrating their first birthday on the 18th of this month. Since they live so far from each other they will not be having their birthday parties together. We celebrated my grandson’s birthday last weekend and will be celebrating my granddaughter’s this weekend. I can scarcely believe they will be a year old already! Little Ollie is walking holding on to objects. It will not be much longer and he will be mobile under his own power. He has suddenly started moving to the beat of music when he hears it too. Little Cassie is pulling herself up and attempting to walk as well. They are both very talkative regardless of whether we understand their language. I can make out that Ollie says Da Da and mom mom but the rest sounds like gibberish. But they are growing and learning and that is the important thing. 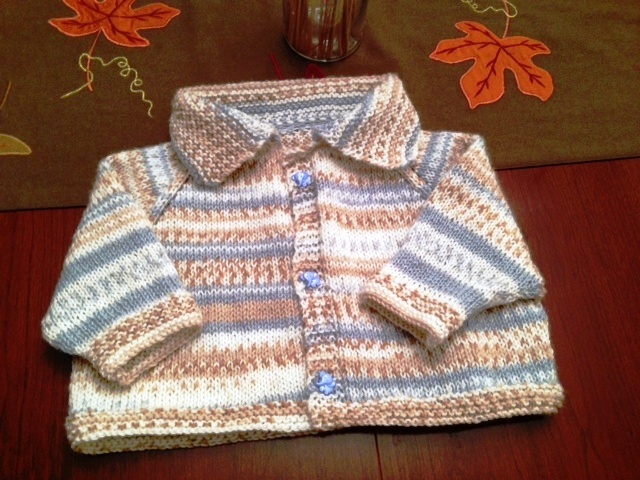 I have been making a sweater for Ollie as my daughter requested one for the chilly Autumn mornings. I have been working on it every night for about an hour. I finished it at two minutes to 11:00 p.m. the night before his birthday party. I had thought it was going to be way too big for him but it fits him just fine. I was thankful for that. Now I need to get busy and make one for Cassie. The list never ends! I have to say that I have already started my Christmas shopping and have started stocking up on flour, sugar, chocolate, etc. for the holiday baking. Hopefully, I will not be running around at the very last minute this year trying to get everything done. Do you have any holiday traditions that practice every year? If so, I would love to hear about them. Until next time, take care and remember to help others and be kind to all you meet. Supposing you had values in Column A of your worksheet and a list in Column B. There is a conditional format that make any value in Column A turn red if it is also in Column B and you want to sort or filter by that result. This is not terribly difficult to do. All you have to do is set up your data and your conditional formats to your liking. Select all the cells you would like included in the sort. Display the Data tab of your Ribbon. Click the Sort tool to open the dialog box. Using the Sort By drop-down list, select Column A, where your conditional formatting has been applied. Using the Sort On drop-down list, select Font Color. Using the Order drop-down list under Order, select the color you would like to sort by. In this instance it would be red. Using the second drop-down list under Order, specify whether you want the red font cells to be on top or on the bottom of the list. That’s all there is to it. If the colors of your cells change because of conditional formatting, you can resort your table and you will have no problems. Should you want to filter by the colors you can easily do that using an AutoFilter. Turn on AutoFiltering by clicking on the Data tab of your Ribbon. In the Sort and Filter group, select Filter. Click the down-arrow at the top of Column A and you will see many options available to you. Select Filter by Color to display a list of the colors that are in your column. Select the color that you would like displayed. Usually one would select Automatic. Copying data from a table is fairly easy because you can do it using the copying method that you have been using for practically forever in Excel. Filter your table as you normally do , so that it displays only the records you wish displayed. Select the table cells you would like to copy. Click CTRL + C to copy the data to your Clipboard. Select the cell where you would like to paste your copied cells. Click CTRL + V to paste the data. When you use this method to copy data from a table, Excel will only copy those cells that are visible. One of the questions I am frequently asked is how to create compound characters in Word. Sometimes folks want a caret in a mathematics or scientific equation. Word, by default, makes certain compound characters available to you straight out of the box. These characters depend on the typefaces you employ in your document. You can very easily insert special compound characters in your document using the Symbol dialog box. Heck, I have a shortcut to the Symbol dialog on my QAT – that’s how often I use it! Just select the character you would like and click to insert it. If, however, there is not a default compound character that you need included in Word, you can use special fields to make your own synthetic compound Characters. Position your cursor where you would like your compound character to appear. For our example, we will be using an x.
Click CTRL + F9 to insert field braces. You must do it in this manner. If you try to use manual braces it will not work for you. Inside your field braces, key in EQ\o(X,). Place your cursor between the comma and the closing parenthesis. Depress your Alt Key as you use your numeric key pad and key in 0136. This will insert the caret character that is most appropriate to creating the compound character. Delete any extra spaces appearing in your field. Click Shift F9 to show the results of the field code.